Your destination for quality food, drinks and entertainment. Rock Creek Kitchen & Bar is your destination for quality food, drinks and entertainment. Along with live entertainment, events and a vibrant nightlife, Rock Creek Kitchen & Bar offers a wide selection of craft beer and signature cocktails as well as a mouthwatering menu crafted by our in-house chefs. Rock Creek Kitchen & Bar is the perfect venue whether you’re looking for somewhere to grab dinner and drinks, watch the game or even plan your next party. Italian sausage, scrambled, eggs, potatoes, blended cheese. Half pound burger, fried egg topper, cheese and bacon with tater tots. Two eggs your way, bacon or ham with tater tots. Tater tots covered with onion and peppers, two eggs any style, sausage, crumbled bacon with queso sauce. Two fried eggs, Swiss, bacon, mayo, lettuce and tomato on multigrain bread with tater tots. Fried tortillas topped with salsa, cheese, sausage, scrambled eggs, jalapeño, sour cream. Grilled chicken topped with bacon, cheddar cheese, pineapple and BBQ sauce. Grilled chicken breast topped with bacon, lettuce, tomato and choice of cheese. Breast of chicken coated with a Romano-parmesan crust topped with red onion, roasted red pepper, lettuce and tomato. Grilled chicken topped with teriyaki, marinated onions and peppers. Capicola, genoa salami, banana peppers, red onion, lettuce, tomato, provolone and Italian dressing on a toasted hoagie. Seasoned grilled chicken, green peppers, caramelized onions, mushrooms and provolone in a toasted hoagie. Caramelized onions and Swiss cheese. Available with grilled chicken or patty. Southwest seasoned burger topped with cheddar sauce, black beans, shredded lettuce, pico de gallo and jalapeños. Mushrooms, onions, caramelized onions, BBQ, cajun, jalapeños, banana peppers, bacon, American, bleu, provolone, Swiss, cheddar, pepper jack. Topped with genoa salami, capicola, provolone and mild pepper rings. Cajun seasoning, dry bleu cheese. Bacon, BBQ, onion ring and cheddar. Shredded lettuce, tomato, 1000 Island dressing, bacon, Swiss cheese and a fried egg. Roasted red pepper, pepper jack cheese, wasabi sauce. 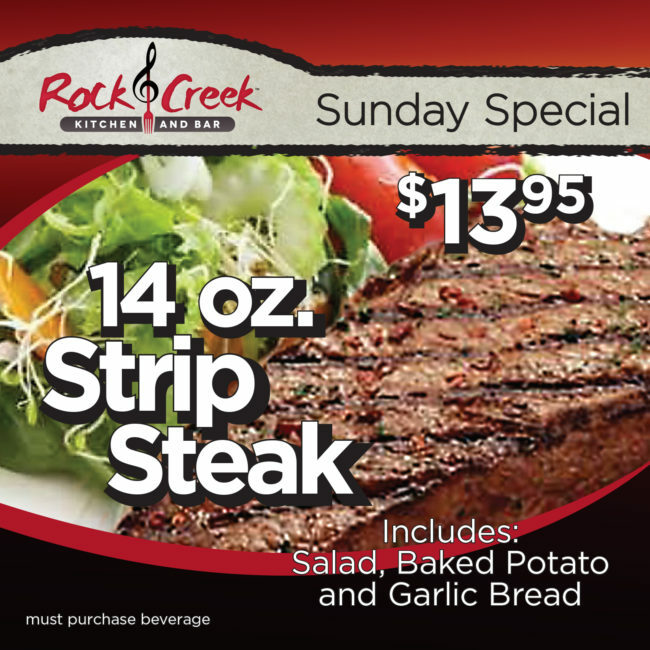 Served with baked potato, garlic bread and house salad. Two pieces of panko crusted fish served with coleslaw and baked potato. Jumbo breaded shrimp served with french fries and coleslaw. Italian sausage and onion in-house tomato sauce over tube pasta with Romano cheese and garlic bread. Two pieces of fish served with coleslaw and fries. Spicy toasted garlic tomato sauce over tube pasta with garlic chicken and garlic bread. Grilled sirloin, roasted red peppers, red onion, spicy marinara, mozzarella. Grilled chicken mozzarella provolone blend, onion, roasted red pepper, jalapeños & Thai sauce. Tomatoes, roasted red peppers, green peppers, red onion, basil, fresh mozzarella, white sauce, balsamic reduction. Breaded chicken, bleu cheese dressing, tomato, red onion, hot sauce, mozzarella. The Sicilian / Roma tomatoes, basil and our famous white sauce. Available Toppings / Mushroom, pepperoni, green pepper, onion, sausage, ham, black olive, mild pepper rings, salami, capicola, red onion. The Sicilian / Roma tomatoes, basil and our famous white sauce. Available Toppings / Mushroom, pepperoni, green pepper, onion, sausage, ham, black olive, mild pepper rings, salami, capicola, red onion. 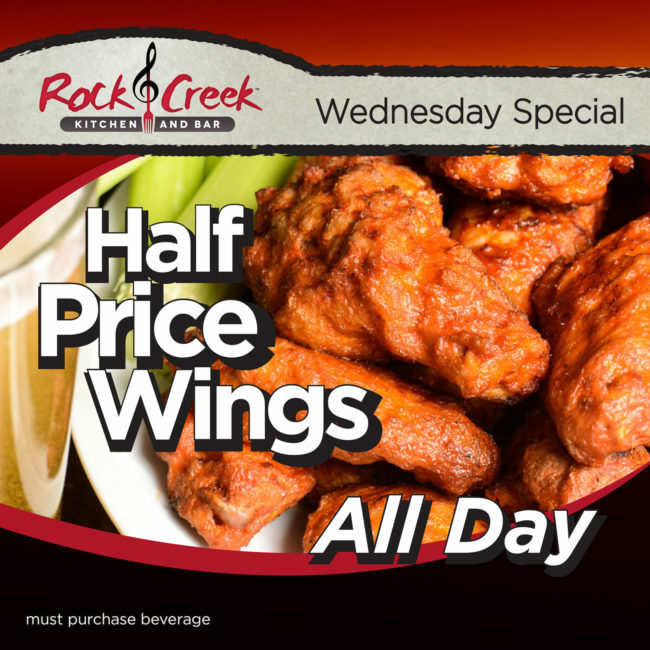 Dozen Wings Dozen Italian Seasoned Wings Dozen Twice Baked BBQ Wings Boneless Wings / With blue cheese, ranch or celery. Sauces / Mild, medium, hot, garlic parmesan, teriyaki, BBQ, hot..
Boneless Wings / With blue cheese, ranch or celery. Loaded with colby-jack cheese and fresh tomato served with salsa and sour cream. Turkey piled high on grilled rye bread with sauerkraut, Swiss and thousand island dressing. Hot pastrami with Swiss on rye with Dusseldorf mustard on side. Breaded chicken breast topped with lettuce, tomato and provolone. Your choice of mild, medium, or hot ranch or bleu cheese dressing. Breaded chicken, marinara, parmesan, provolone. Turkey, ham, capicola, salami, lettuce, tomato, red onion, banana peppers, Italian dressing, provolone. Three pieces of bread piled high with bacon, lettuce and tomato. Served with tomato and bacon on multigrain wheat. Tender cuts of steak sautéed with mushrooms and onions topped with provolone. Fresh homemade tuna salad with lettuce, tomato and cheddar on grilled rye bread. Ham and turkey piled high with bacon, lettuce, tomato and Swiss on multigrain wheat. Grilled chicken, lettuce, tomato, red onion, ranch dressing and Swiss. Shaved turkey, bacon, lettuce, tomato, cheddar cheese with ranch. Breaded chicken diced tossed in mild, medium or hot sauce with lettuce, tomato, cheddar with bleu cheese or ranch dressing. 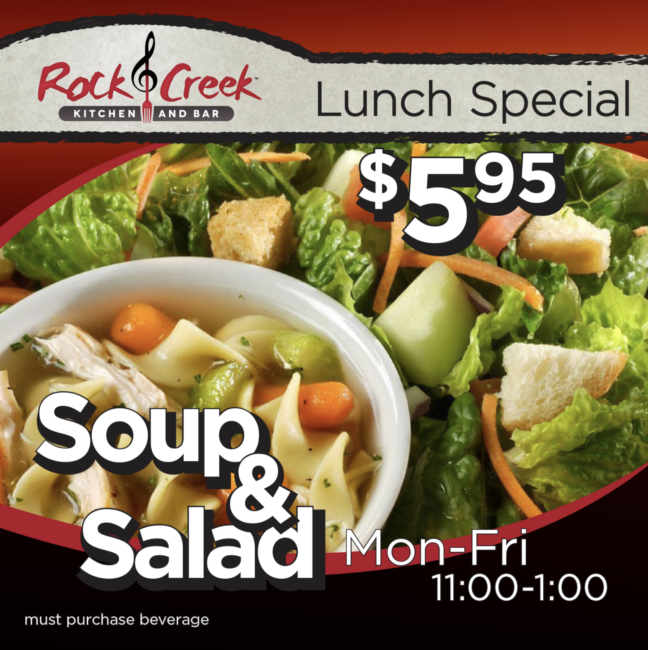 Chicken Caesar / Grilled breast of chicken mixed with our.. Breaded chicken diced tossed in mild, medium or hot sauce with lettuce, tomato, cheddar with bleu cheese or ranch dressing. Chicken Caesar / Grilled breast of chicken mixed with our fresh caesar salad. Grilled chicken, lettuce, cheddar cheese, bacon, roasted red pepper, red onion and sriracha mayo. Tomato, mozzarella cheese, basil, olive oil and balsamic. Homemade tuna salad over a bed of lettuce with fresh tomato, cucumbers, black olives and onions. Mixed greens with turkey, ham, American cheese, Swiss cheese, tomatoes, red onion, cucumbers and hard boiled egg. Mixed greens, black beans, crispy tortilla strips, red onion, cheddar cheese, tomatoes, cucumbers, grilled mesquite chicken, with a chipotle ranch vinaigrette. Fresh tortilla, chili, cheese sauce, jalapeños, pico de gallo. Available with chicken or steak. Sautéed with garlic and white wine sauce. Served by the basket with honey dijon mustard. Seasoned tenders with honey mustard, BBQ or ranch. Served by the basket with cheese & bacon. Served with our stoneground mustard and queso sauce. Tender chicken bites dipped in waffle batter and fried, topped with powdered sugar and served with maple syrup. Meatballs topped with homemade marinara, fresh mozzarella and provolone. Stuffed with Italian sausage, baked in-house tomato sauce with Italian cheeses. Pork egg rolls served with honey mustard or teriyaki. Rock Creek Kitchen & Bar is the perfect venue for your private event. With a full bar, kitchen and A/V we can host your launch party, company party, reception or any event you can imagine. We are now booking parties, fundraisers and events! Rock Creek Kitchen and Bar presents a full calendar of events with a little something for everyone every night of the week. 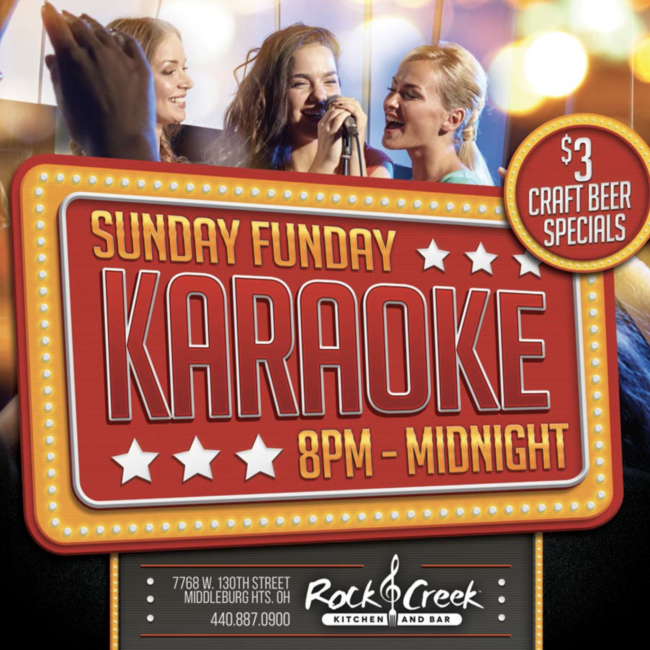 Rock Creek features live bands, DJs and Karaoke throughout the week. 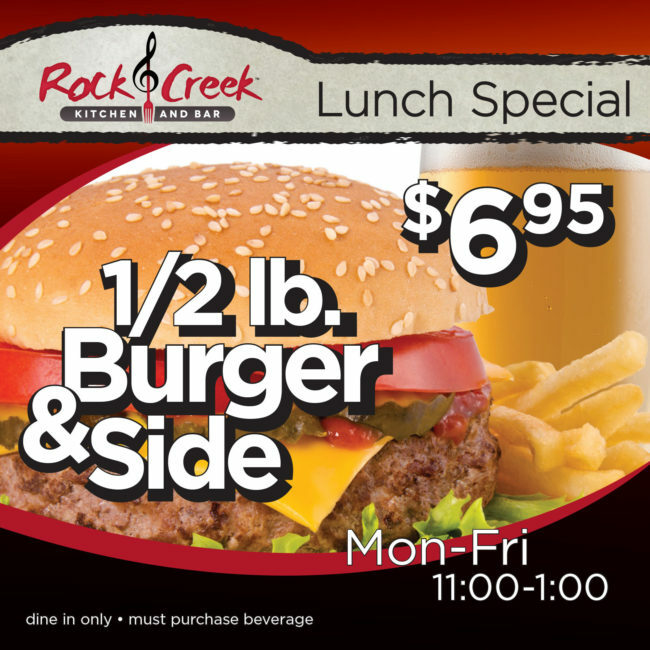 We also play your favorite music videos on our in-house video screen every day. 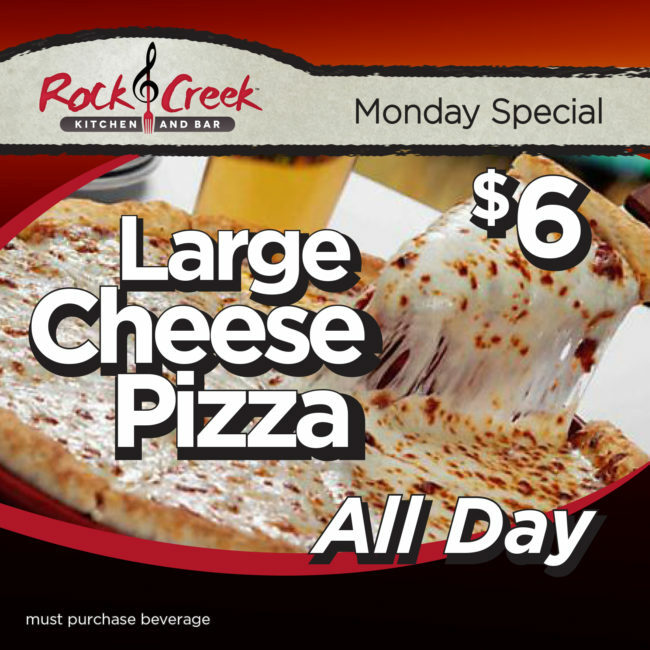 EVENT: All Day Every Monday! EVENT: Every Sunday 8PM - Midnight! Karaoke – Every Sunday 8PM – Midnight! 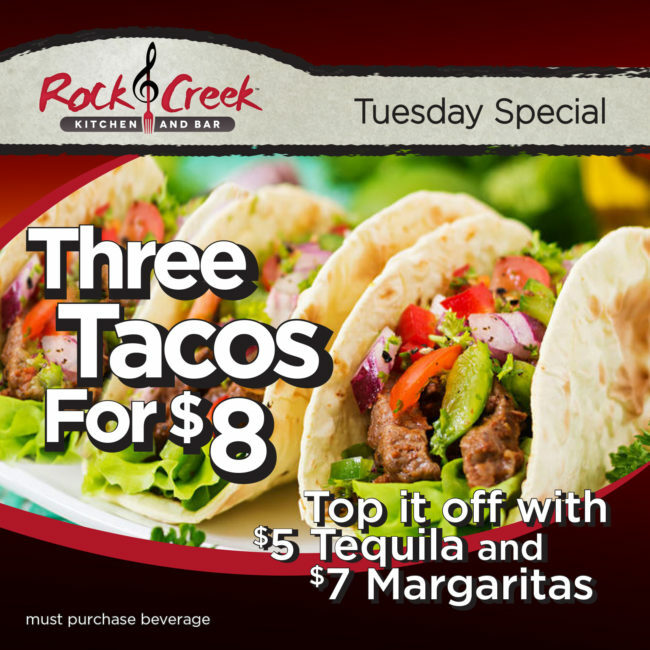 EVENT: All Day Every Tuesday!